I wanted to make a million dollars. Or at least break even. When was the book released? The official launch for Amber Fang was Tuesday, October 25th, 2016. There was a pre-sale on several channels for two weeks before that. The numbers I'll discuss will be from pre-sale on Oct. 4th to Nov. 16th, 2016. The ebook was available on all channels. The paperback was available only through Createspace (Amazon's Print on Demand service). C'mon, show us a chart! Okay! Okay! Here's the most important chart. These are the launch week sales on Amazon. So obviously that's helpful. The book reached similar positions in Amazon Canada (but not so high in the UK store). The US centric results are mostly due to the advertising I'd purchased in newsletters being mostly targeted at US book readers. After the initial launch it settled in to sell about 10-20 copies a day. But how many copies did you actually sell? Fess up! So there were go. A month of sales has tallied up to 839 copies. No comment! By that I mean I'll answer your question later. Here's another chart to distract you. So as you can see Amazon was where the majority of my sales were. Kobo was #2 and Apple #3. The Createspace paperbacks are also included in the chart. I had decided to go "wide" (that is, not exclusive with Amazon) because I didn't want to disappoint any of my fans (and I like the idea of a wide open market). Those 40 copies on Kobo propelled the book to #1 or #2 on several of their charts. The curious thing is that all of those copies were purchased in Canada. I didn't sell a single Kobo copy to other countries. But Canada is Kobo's largest market, so I guess that explains the result. C'mon. Where's the money? Tell us about that. And there it is. The breakdown of income and expenses. As you can see Amazon (and Createspace and affiliate money) amounted to most of my income. I put the expenses chart there, too. So there is money left to earn before this vampire book breaks even. On a cheeky note, I was going to title this blog post: HOW I MADE 78,000 CENTS IN ONE MONTH! So are you happy with the results? Mostly. Like any project you want it to be an outstanding, mind-blowing success so you can pay off your mortgage and buy a moonbase. But--it turns out selfpublishing is work. These numbers are something I can build on. Right now the book is selling about 10-20 copies a day on Kindle (which nets me about $20 to $40). My understanding of the Amazon algorithm is you have about 90 days before the book drops off. So if it continues at this pace, then I'll earn my money back in about 60 days. Sales have trickled to very little on the other vendors. Each day my newsletter is growing (3200 right now) so by the time I launch my next Amber Fang book (in about 4 months), I'll have a larger launch platform. Generally the reviews for the book have been quite positive, so that is also encouraging (especially the good reviews from readers who don't normally read vampire novels). Plus, I've committed to at least do three books in the series. I don't like to leave things undone. Yes. If this info has been helpful to you, I dare you to click the pic below (or this link) and give Amber Fang a try. 839 readers can't be wrong! Oh, and comments are welcome. I obviously still have so much to learn. Whoa! Two Years of Selling Ebooks! What? Where did those two years go? Back in February 5th of 2011 I launched my novel DUST as an ebook (for sale in the US and UK, because those are the countries where I owned the rights myself). Those were heady days! But I've blogged about them on previous occasions, so I won't retread that ground. Just start reading from the beginning or skip ahead to the amazing 1 1/2 year report. Hey, that number in the bottom keeps going down each month. 249 copies seven months ago. 53 copies sold last month. I do think there is much more competition out there now and that there was a big blitz on sales while everyone and their pet got an eReader then filled it up. And the drop in sales is also because of the algorithmic changes Amazon made to how they weight the price of books on the sales chart (if you sell a 9.99 book, it'll jump higher up the sales chart than a .99 cent book). It became harder for my books to climb the charts and get noticed by buyers. Yet, I'm happy with the sales. It's still passive income for me that will go on as long as there are eReaders in the world. I really don't do much extra work to earn that income. And I'm very much a less work for more money kind of guy! 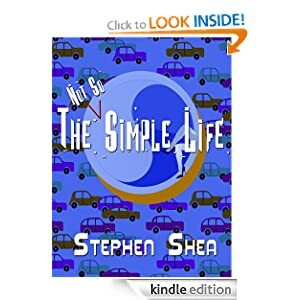 Art As a public service I'll attach these clickable links to my books, including the two "grown up" books I've published under the name Stephen Shea. If a book isn't available in your area as an ebook, it's because I'm still negotiating the erights for that book. So sorry for any confusion. Last Friday, being a dutiful Mac cultist, I drank my iCool aid and headed down to my local Mac store to buy the latest version of the iPad, creatively titled The new iPad. I already owned a first generation iPad (which I blogged about here) and had found it absolutely essential to my life as a writer. I waited for the 3rd generation because I was looking forward to the rumoured retina screen (a fancy way of saying a very high-def screen) and the camera (which was lacking from the 1st generation iPad). I bought the 32GB white wi-fi, because I thought that would be enough storage space for me and I don't need a G4 connection. Wireless is most everywhere (and I do have portable Mifi wireless when needed). Let's start with the screen. It's amazing. There, we're done with the screen. Okay, I'll leave it to others to explain exactly how many pixels it takes to make your eyeballs vibrate with explosive colour. But side by side it's very clear how much more "high def" this screen is. The icons for the apps have no pixelation. Does that make them easier to tap on? Nah, but it somehow makes them see more real. Netflix looks clearer. Movies sparkle. Youtube is ... well, still full of freaky videos. But they're even clearer and grosser now. I'm an ebook-a-holic (along with a paper-book-aholic and an audiobook-a-holic). My apps on my iPad for reading (and buying books) are as follows: Kindle app, Kobo app, iBooks, Nook, Nook for kids, Play Books, Stanza. These apps are pretty simple so I didn't notice a big difference in the speed in which they open. There is a difference in the fonts and how clear they are now to read. And I am especially impressed at how much more colourful the picture books that I have on my iPad look. Nothing replaces a "real" picture book, but the images on the iPad do leap off the page (Especially in Splat the Cat). I do have a few kids books apps that were designed for the iPod and I never noticed a big difference in clarity when they were on my old iPad, but now that I have The new Ipad, the blurred edges of the images becomes very obvious. So reading is even more of a pleasure on The new Ipad as long as what you're reading has been optimized for the iPad (though if I'm reading an ebook I often choose my Kindle because it's smaller and I'm not tempted to zoom around the internet). The new iPad is heavy enough that I usually have to prop it against my legs when I read. This machine is brilliant for using both these communication programs. The speaker on the back is able to put out more volume than the 1st generation iPad so it's easy to hear whoever you're Facetiming with and the mic seems to pick up fine. One could easily use this to Skype with a classroom just sitting in your reading chair or out in your back yard (assuming there wasn't much background noise). And, last night, my wife's bookclub was discussing Meg Wolitzer's latest novel and she was kind enough to do a Skype visit with the book club. It worked perfectly and in the hour and a half talk it burned 18% of the battery power. I set up a battery-powered speaker so that she could be heard clearly. I was tempted to set her up on a chair and put a coat around her, but decided that would be silly. There isn't much difference between the iPads. I still use Hootsuite for most of my social "outreach": twitter and Facebook, that is. Things are faster, of course. The biggest difference is that Google+ is more accessible on this machine. Again surfing around the net does appear to be a smoother experience. I don't know if it's the extra speed of the machine or that there are more and more websites optimized for the iPad now. I still use Keynote for my school presentation. This is by far the best aspect of the iPad for me. I can carry all of my presentations with me, and all I need extra is the VGA connector. No power cords, at all. I connect my iPad to the projector and plug in the sound and the iPad does the rest. I'm very impressed at how it runs everything I can throw at it: book trailers, mp3s, and SFX all embedded in my slides. I use my iPod Touch to run the presentation from the front of the classroom. And I can do a whole day of school visits without having to charge up. I don't miss the days when I had to lug my laptop and my projector and, sometimes, even my screen. There isn't a big change in how Keynote runs on the new iPad. Which is good, because it was running fine before. If I'm doing any writing on my iPad (and I do a little, usually with my wireless keyboard) I use Pages (which is my main word processor on my iMac, although I do all my first drafts in Scrivener). It's perfectly functional on the iPad, though obviously the screen is smaller. Apple's iCloud is effective, automatically updating documents between different iPods and iPads, but if I make a change on my computer it doesn't appear on my iPad. I have to upload it to icloud.com (simple drag and drop) and the new file appears on my iPad. I do hope someday there is full synchronization between all mac devices, of course. But this is workable. I teach an online class through the New York Times Knowledge Network. One of the things I was curious about was whether or not I'd be able to mark papers while I was on the road with my iPad. It turns out I can. I download the document, convert it to a PDF using Pages, then use an app called iAnnotate PDF to do all my fancy mark ups. It has handy highlighting and note-making features. Plus you can circle words in red just using your finger. Such fun! Then I can email it to my student and hope they don't weep when they see all the marks. Okay, it's just a graph. I apologize for calling it amazingly interesting! As you can see after the big "sale-apalooza" in September (1467 copies) sales have levelled out to 493 in October and 586 in November (actually my second highest sales month now). So sales are beginning to trend upwards, though part of this is due to the fact that Tribes was "free" on Amazon last month and that brought the sales of other books up (and the sales of Tribes rose once it went from free to paid status). What's interesting to me is the colour of the November column. Psychedelic, eh? Well, actually I point it out because each colour represents a different book. A variety of my books are selling consistently now, which is a good thing (the blue colour represents DUST which is still by far my bestselling book). And my monthly income will be just over $800.00. Hey, that's a mortgage payment! I'm always looking for a clever title for these updates. If anyone has any clever titles please send one my way. 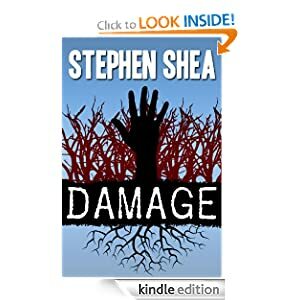 I can't keep using Stephen King in my title! He'll come to my house and challenge me to a write off! I can't keep up with that guy! I figure people like the $$$ sign so maybe I'll just keep using that. Anyway, here's the report on my ebook experiment for October. What you say? You're late! Well, I decided to move these reports to the middle of the month because that's when Amazon sends me my monthly sales records (up until that point it's a bit of guesswork as to exactly how many copies I've sold). So here is your first chart! Aha, you say. Your sales dropped in October! Ha, so much for that yacht you were dreaming about when you sold all those copies of DUST in September. But wait, I say, let's celebrate the good news first. There have now been over 3000 copies of my self-pubbed books sold. As we speak 3000 people could be reading my words. Or playing games on their iPad. Anyway, that's a nice milestone to pass. 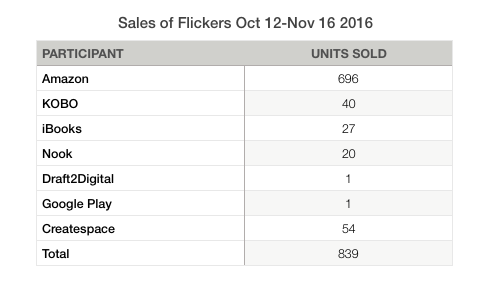 It's also important to note that October was the second highest sales month so far. I did expect sales to slow down after that first bump that I received in September. Mostly that's because I raised my prices. Dust was no longer $1.49 but was bumped up to $2.99. At that price I get the 70% royalty from Amazon. So for each 1.49 book I am making .52 cents (because any book priced at .99-2.98 is a 35% royalty), but for each 2.99 book I'm making $2.09 (or 4x as much). That means I only have to sell 1/4 of the number of books to make the same amount of money. That's math even I can do! Ah, so let's talk about the money. And about the beautiful American dollar and the lovely British pound. Doesn't the image above make you all teary eyed? Anyway, wipe away the tears. In September my income from U.S. sales on Kindle was $557.64 and from UK Kindle £216.49 which, once converted, adds up to about $897.98 US (I won't further complicate this by converting to Canadian since our dollar is nearly the same as the US). That's a nice tidy sum for very little work (err, if you don't count the weeks it took me to figure out all the various ways to convert files and upload all that ebook "stuff"). So I made $898 dollars by selling 1467 books in September. In October I made $251.96 from US Kindle store and £339.35 from the UK Kindle store for a total of $785.12 U.S. Except this time I only sold around 493 copies. And obviously it's easier to sell fewer copies than it is to sell more. Two other short observations. One is that the October sales were partially propped up in the UK store because I was giving The Hunchback Assignments away for free for two weeks of that month. The second is that I'm starting to have more sales through the UK store because I have 10 books available there and only 7 in the US (I'm publishing my three Hunchback Assignments books in the UK Store but they are published through Random House in the US). The only problem with higher prices is that you drop out of the bestseller charts faster and therefore fewer eyes are seeing your books. Already I see that my November sales are slowing. I have yet to have a book "stick" in the charts for a long period of time. This is the Amazon ranking for The Hunchback Assignments on UK Kindle charts. As you can see it was selling a copy every once in awhile, thus the zig-zag pattern. Then it went "free" on Sept. 23rd (creating that straight line) and became "paid" around October 16th and jumped up to about 1000th spot on the charts (which made it one of the bestselling kids books for a few weeks). It's continuing to slowly decline but it pops back up every once in awhile. Does anyone have any glue? I'd like to stick it in the top 500 at the very least. Until Kindle sticky glue is invented, I'll keep on keeping on! P.S. I do refer to Kindle a lot. My books are sold on other sites. In October I sold 1 book on Kobo, 1 Book on iBooks, and 5 books on Barnes and Noble, so obviously it's easiest to talk about Kindle.